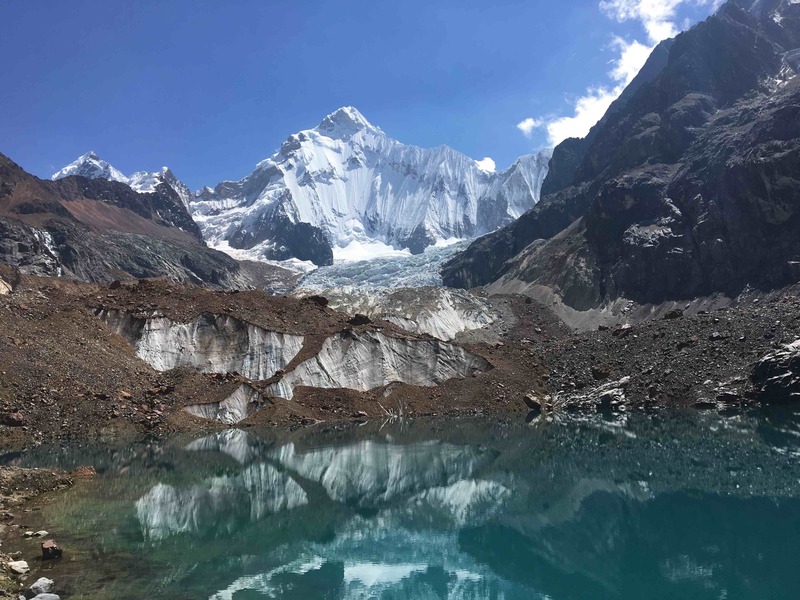 This post is a continuation of my eight day trek in the Cordillera Huayhuash. Follow along using my trail map. After a mile on trail I again disengaged straight in the direction of a pass. 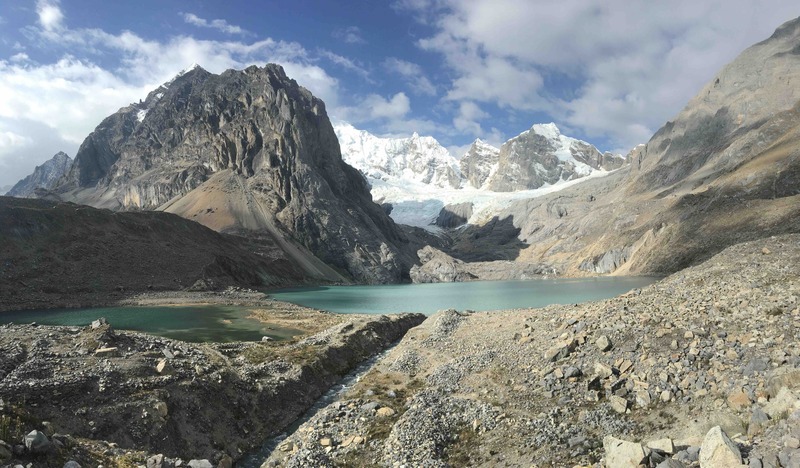 Crossing a flat basin and then climbing consistently higher towards a single prominent glacial clad mountain. Trudging up and over my second 16,000 ft pass I am plunged into the ‘otherworld’. Dark stone mountains dressed in rolling white glaciers are replaced by desert spires, red dirt and gray lava flow (right). I spent the next couple hours admiring the landscape, imagining climbing one of these spires with their vertical shoot-like features as I descended. Eventually making my way to leveled out valley campsite partially protected from the wind by a giant bolder. Neon cook tent below belongs to a guided group sharing this campsite. 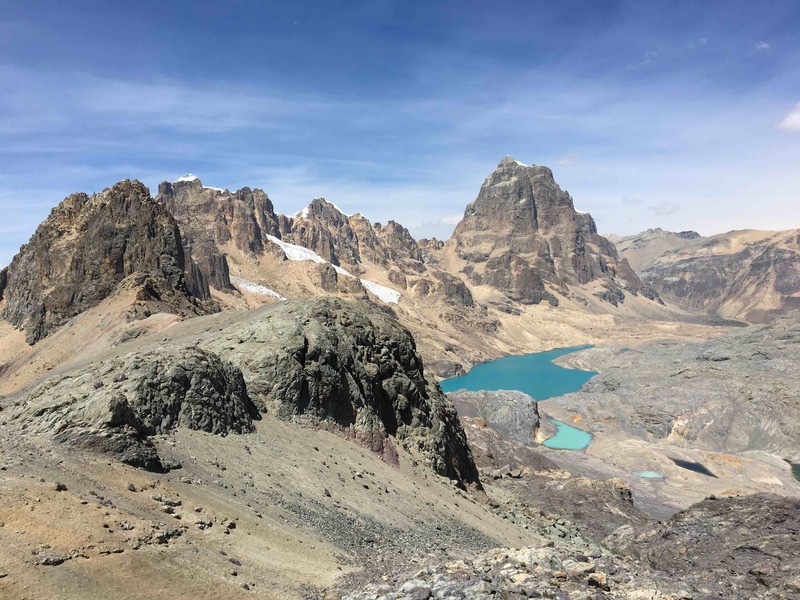 Most groups climb the 16,000 ft San Antonio Pass for the views and then turn around. The steep scree on the other side has more risk than most guides are willing to take with their groups. No guide? No problem. What a beautiful view from San Antonio Pass! San Antonio was shortest ascent of the trip and speed descending steep scree down the other side was exhilarating and fun. Wishing to avoid descending and then re-ascending to check out Lake Juraucocha I had the great idea of alternatively traversing right to drop into the parallel sister pass. The map made it look doable after a little steep section and there was even a trail in that direction! Unfortunately, I would loose 2.5 hours and a lot of energy in this gamble, eventually being turned back by a sharp cliff ridge perpendicular to the slope. While my map was great with features parallel to topo lines, its detail suffered poorly regarding rock features perpendicular to the slope such as thin, steep ravines or in this case, knife-edge ridges. After a tiresome backtrack up scree I took the left ‘main path’ down. Like many times before, this ‘path’ quickly disappeared into cow paths so numerous they thatched the side of the mountain. I was left to my own navigation to bypass steep ravines and dangerously sloped mountainsides. A frustrating couple hours later landed me in the basin below and I had just enough energy to check out Lake Juraucocha nearing sunset. On the morning of Day 6 I woke in a hurry and experienced one of the more humiliating moments of my life related to traveler’s sickness. Rallying my moral I decided to start my morning with a side-trip shouldering up to a glacier. 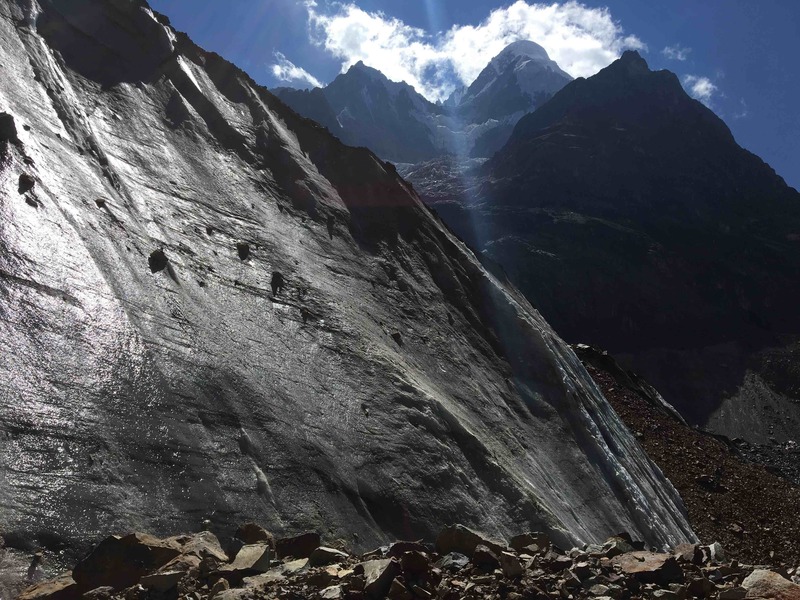 As a little fun anecdote, I wanted to touch the front glacial wall of the glacier Joe Simpson fell into when climbing Siula Grande in Touching the Void. In addition to touching a glacier the view was really great too, but the entire thing took four hours given the distance and the amount of route finding I had to do to cross some engorged rivers. After lunch, I spent the next six hours trekking nine miles under mostly headwind feeling uncomfortably bloated. The discomfort of six days of traveler’s sickness on trail and a difficult morning had taken a hit on moral. I spent an hour talking myself out of giving up eating altogether. After a ten hour day I arrived at camp exhausted, concluding my nightly chores such as filtering water in the dark. Most people feel stronger as the days tick on for longer treks but being sick and not eating enough because of it made me feel weaker, even with a lighter backpack. 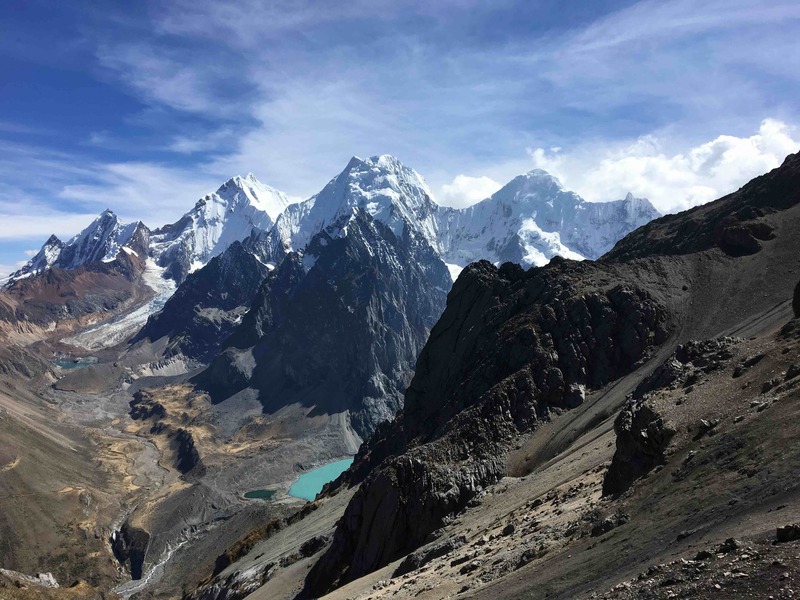 I slowed my pace in response and tried to focus on taking in the amazing Huayhaush scenery whenever I stopped. In one such moment, I saw my first native mammal of the Huayhuash! A Northern Viscacha has a body and ears like a rabbit but a tail and movement of a squirrel. After ascending my first pass of the day I looked ahead to the final 16,000 ft pass of the trip, picked my route and moved very slowly and steadily upward. 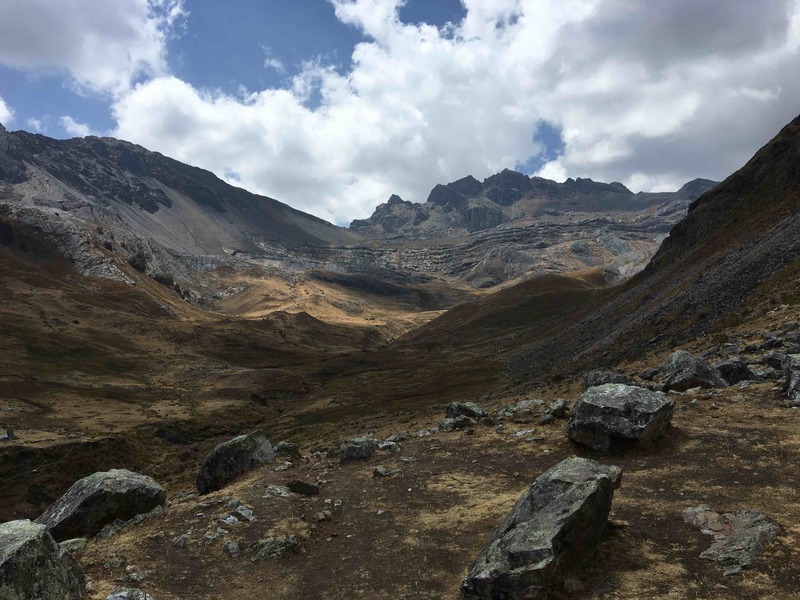 I griped to myself on this section (mostly because I was struggling) about how I should be smelling rock and dirt of rugged wild mountains when instead I smelled the fresh droppings of guide donkeys that climbed the trail that day. Once over the pass I made a difficult decision to take the main way down instead of the more adventurous ridge footpath. This was the only compromise I would make on the Hauyhaush to choose the road more traveled, but it was necessary considering I had to bandage my knee on the way up with a compression wrap because it was hurting. On the way down the Huayhaush offered up one last amazing view to quell my grumbles. 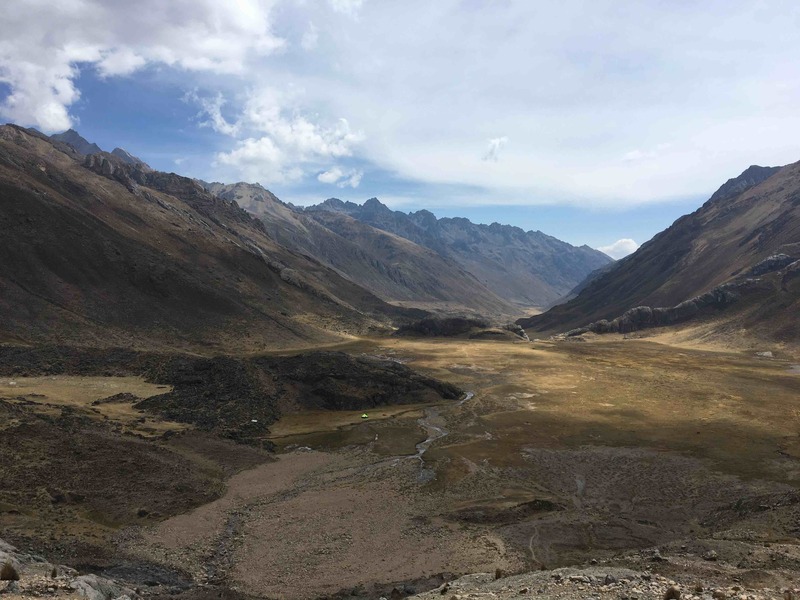 Another beautiful valley campsite in a basin fronted with glacier fed lakes on the feet of prominent 6000m peaks. That night in camp I met up with the Israeli group from several days earlier and shared in a lamb that their guides had purchased from the local community. They fueled a fire over a pyramid of rocks using cow pies and once they were hot spread them out, covering them with meat and potatoes before covering it all with a tarp to create a steam cooker. It was a really cool experience, the best lamb I ever had and a joyous mood inside the tent. For the first time, I started my trek earlier than the guided parties at 5am. The bus leaves Llamac towards Chiquian (where I transfer to my second bus going to Hauraz) at 11am. I had one last ridge climb and considering how weary I was the day before I didn’t want to miss it. A couple hours in, I climbed my 1000 ft and gave one last look at the rolling mountains before crossing over the ridge. 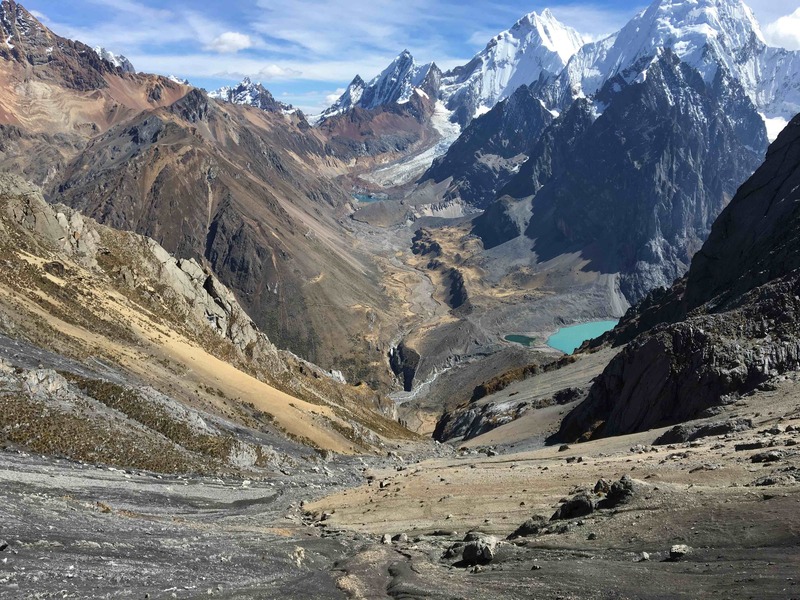 A river canyon below between me and my last glimpse of Huayhuash mountains. A guide with several donkeys came hustling up from behind and asked me the time. My phone had just died so I didn’t have it. He asked me if I was going to Llamac, let out a “I don’t know if you are going to make it” sound and said lets go. Something happened with his horse so I ended up accidentally driving his donkeys a quick pace down the mountain with him some distance behind. I couldn’t pass them! Eventually though I rounded his donkeys and increased my speed down a cripplingly steep 3300 ft descent to Llamac. I reached the bus station an hour early, pushing my body and joints to the limit for no reason. Here in Llamac I met a man who had just completed the circuit unsupported like me. 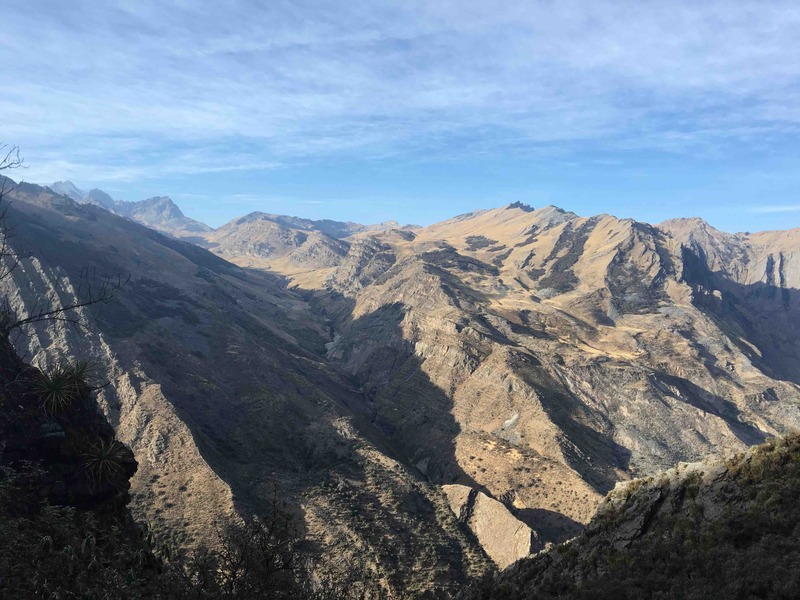 He shared of how he did the Huayhaush 35 years prior when there was really no one around, less trail erosion, less cattle and this bus to Chiquian didn’t even exist. It was a fun conversation and great way to finish the trip. When I arrived to Hauraz I that night I was incredibly thankful for a bed, a hot shower and a toilet. I’ll remember the Huayhaush as both very hard and incredibly beautiful. Even though the milage each day wasn’t that long I typically took 6-10 hours to complete it due to elevation gain, route finding and more importantly, the altitude which really drained me. 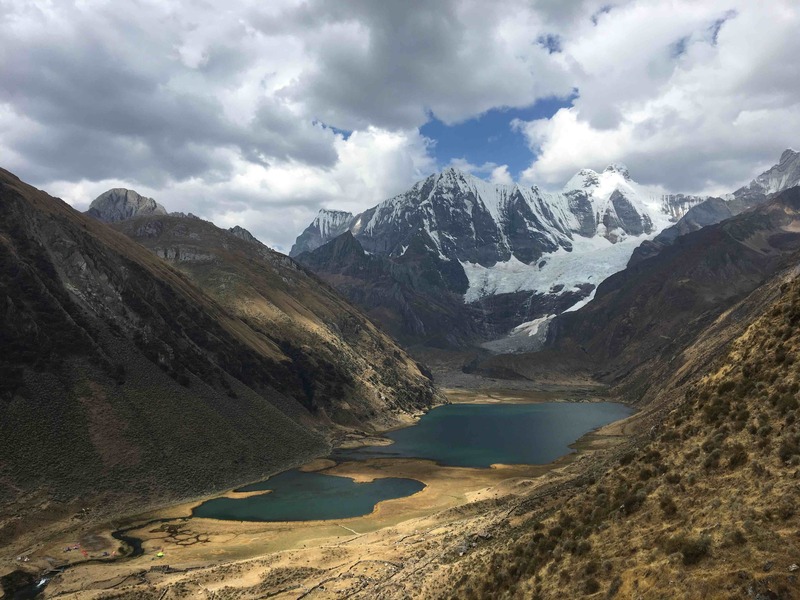 I highly recommend this trek for anyone who wants to intimately experience the high andes of Peru and feel an arms reach within 20,000 ft giants.